Bookended by tragedy, Vera Buchanan’s brief tenure in the U.S. House of Representatives began in 1951 as an extension of her late husband’s legislative efforts representing blue–collar steel workers in southwest Pittsburgh. But by the time she stood for re–election 18 months later in the newly reapportioned, more center–city district, Buchanan demonstrated that she was not merely a caretaker of the office her husband once held, but a skilled politician in her own right. Vera Daerr was born in Wilson, Pennsylvania, on July 20, 1902, daughter of John Daerr and Jennie Leasure Daerr.1 She grew up in the steel mill town of Duquesne, Pennsylvania, and attended local public and parochial schools. After high school, she worked as a secretary for a Duquesne steel company. In 1929, Vera Daerr married Frank Buchanan, an automobile dealer and teacher, and the couple raised twin daughters, Jane and Joan. In 1942, Vera Buchanan helped her husband win election as mayor of McKeesport, a post which he held for four years. Vera operated a beauty shop and was a member of the Democratic Women’s Guild. As the first lady of McKeesport, she conducted a listening campaign to familiarize herself with the needs of constituents and began cultivating a support base for future election campaigns. In May 1946, Frank won the special election to fill the vacancy left in the 79th Congress (1945–1947) by the resignation of Representative Samuel Weis. The Congressman was re–elected to the next three consecutive terms. Serving on the Banking and Currency Committee, Frank Buchanan became an expert in housing legislation and earned a reputation as a bright, candid, and liberal Member of the House. He chaired a select committee that brought to light extensive corporate and union lobbying efforts on Capitol Hill.2 Vera Buchanan served as her husband’s secretary during his five–year tenure in Congress. In the House, Vera Buchanan served on three committees: Banking and Currency, Merchant Marine and Fisheries, and Public Works. In early 1952, she resigned her Merchant Marine and Fisheries post to concentrate on her remaining assignments.9 As had her husband, Congresswoman Buchanan employed her daughter, Jane, to serve as her secretary. Congresswoman Buchanan demonstrated an independence from parochial interests. She supported the development of the St. Lawrence Seaway Project, and her appointment to the Public Works Committee in 1952 led to open speculation that the long–stalled piece of legislation would begin moving through the House.13 Initially, opinion in her district had been against its development, but it became more evenly split after the discovery of the large Labrador iron ore deposits in Canada (iron was a critical raw material for steel production). Buchanan’s reasoning was simple and extended beyond the narrow focus of her district. She argued that since the seaway would be built either jointly with Canada or without any U.S. involvement, that it was in the “national self–interest and the self–interest of every industry and business in the United States [to] require that our Government have a full, equal voice in the construction and operation of so important a waterway—a full and equal voice on every aspect of the operation.”14 The House eventually approved U.S. participation in the St. Lawrence project in 1956. 1“Vera Buchanan, Lawmaker,” Dies, 27 November 1955, New York Times: 88. 2“Frank Buchanan,” 30 April 1951, Washington Post: 10. 3“Mrs. Buchanan Dead; In Congress 4 Years,” 27 November 1955, Washington Post: A16. 4Hope Chamberlin, A Minority of Members: Women in the U.S. Congress (New York: Praeger): 228. 5Chamberlin, A Minority of Members: 227. 6“Grandmother Runs for Seat in Congress,” 22 July 1951, New York Times: 45. 7Congressional Record, House, 82nd Cong., 1st sess. (26 July 1951): 8986. 9Congressional Record, House, 82nd Cong., 2nd sess. (29 January 1952): 593. 10Congressional Record, House, 83rd Cong., 2nd sess. (30 March 1954): 4111–4112; see also, Congressional Record, House, 83rd Cong., 2nd sess. (20 July 1954): 11106–11107. 11Congressional Record, House, 82nd Cong., 2nd sess. (28 June 1952): 8536–8537. 12Congressional Record, House, 84th Cong., 1st sess. 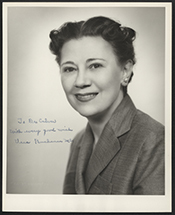 (15 June 1955): 8336–8337; Memorial Services for Vera Daerr Buchanan, 84th Cong., 2nd sess. (Washington, D.C.: Government Printing Office, 1956): 33. 13“Chances for St. Lawrence Seaway Brighten as Friend of Project Joins House Committee,” 31 January 1952, New York Times: 19. 14Congressional Record, House, 83rd Cong., 2nd sess. (6 May 1954): 6160. 15Congress and the Nation, 1945–1964, Vol. 1—A, (Washington, D.C.: Congressional Quarterly Press, 1965): 108; for more on “massive retaliation,” see John Lewis Gaddis, Strategies of Containment (New York: Oxford University Press, 1982). 16Congressional Record, House, 83rd Cong., 1st sess. (3 August 1953): A5324–A5325. 17Chamberlin, “A Minority of Members”: 228; McCormack’s account of this episode is similar, although he provides no direct quotations; see Memorial Services for Vera Daerr Buchanan: 21–24. 18Memorial Services Vera Daerr Buchanan: 19. United States. 84th Cong., 2d sess., 1956. Memorial services held in the House of Representatives and Senate of the United States, together with remarks presented in eulogy of Vera Daerr Buchanan, late a Representative from Pennsylvania. Washington: Government Printing Office, 1956. "Vera Daerr Buchanan" in Women in Congress, 1917-2006. Prepared under the direction of the Committee on House Administration by the Office of History & Preservation, U.S. House of Representatives. Washington: Government Printing Office, 2006.